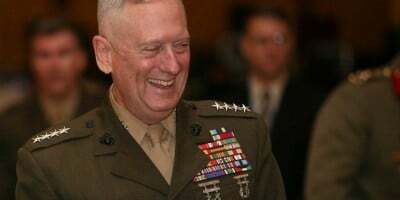 The disclosure by President-elect Donald Trump Thursday night that he will appoint retired Marine Corps General James Mattis as his secretary of defense has been greeted with approval across the political establishment and in the major organs of the corporate-controlled media. Trump made the remark towards the end of his rally-style address in Cincinnati, Ohio, where he elaborated a perspective that combined extreme nationalism and militarism with demagogic promises to defend the interests of the working class. He referred several times to Mattis’s nickname, “Mad Dog,” given to him after he led the savage Marine counteroffensive that retook the Iraqi city of Fallujah in December 2004. Only in today’s America could the nomination of a general with that moniker be hailed as a sign of moderation and good sense. Mattis’s nomination will require special legislation to pass Congress, since current law requires that a military officer be retired for at least seven years before returning to the Pentagon in a high-ranking position reserved for civilians. When the Department of Defense was established in 1947, replacing the Department of War, Congress stipulated that no one who had served as a commissioned officer within ten years (reduced to seven in 2008) could be appointed. Though this requirement was immediately waived to allow for the appointment of General George Marshall in 1950, no former general has occupied the post in the past 66 years. There is, however, no commitment to the basic democratic issue of civilian control of the military within the US political establishment. There is little opposition in Congress, in either party, to the passage of a waiver for Mattis. Mattis has a long and bloody career. He played leading operational roles in both the invasion of Afghanistan in 2001 and the invasion and occupation of Iraq in 2003-2004. He later co-authored the Pentagon’s counterinsurgency warfare manual with General David Petraeus, and held a top position with NATO. He ended his career as head of the US Central Command from 2010 to 2013, overseeing the US withdrawal from Iraq, the increasingly bloody stalemate in Afghanistan, and the US efforts to bolster the Egyptian military against the revolutionary upsurge in that country. He also supervised the drawing up of US plans for intervention in Syria, hailing the armed Islamic uprising against the Assad regime as a potentially devastating strategic blow to Assad’s ally Iran. This public criticism endeared Mattis to all factions of the Republican Party. “Never Trump” conservatives like William Kristol floated his name as a possible independent candidate for president against Trump. Both Trump and Hillary Clinton invited him to speak in their support at the Republican and Democratic conventions, but he declined to play any role in the 2016 campaign. In the corporate-controlled elite media, there is remarkable unanimity in support of Trump’s appointment. The praise of Mattis runs the gamut from conservative to liberal. Within these circles, Mattis—who has differed with Trump on Russia—is seen as a counterweight to any tendency of the incoming administration to move away from the anti-Russia policy. The only real concern expressed by the Times is “whether General Mattis intends to roll back military personnel policy changes adopted during the Obama administration, including opening all combat roles to women, allowing openly gay troops to serve and accommodating transgender troops.” The liberal newspaper-of-record is far more concerned with the gender and sexual identity of American troops than the identity of the people they will tasked with incinerating. What is particularly noteworthy is that all three editorials discuss the principle of civilian control of the military, which would be effectively gutted by the appointment of Mattis, and dismiss it. The Mattis nomination is not an isolated case. Retired Lieutenant General Michael Flynn, former head of the Defense Intelligence Agency, is Trump’s choice as national security adviser, the top White House position coordinating military and foreign policy. Retired General David Petraeus, former US commander in Iraq and Afghanistan and former CIA director, is a leading contender for secretary of state. Retired General John F. Kelly is under discussion to head the Department of Homeland Security. And Admiral Michael Rogers, the current head of the National Security Agency, is likely to be named Director of National Intelligence, coordinating all 19 components of the vast US intelligence apparatus. It is thus quite possible that military officers, active or retired, could end up holding every major national security position in the incoming Trump administration. This is not merely a demonstration of the militaristic character of Trump’s perspective. It must be understood, more fundamentally, as a consequence of the long-term militarization of American foreign policy and American society as a whole. US imperialism has been at war for most of the past 25 years, and continuously since 2001. Barack Obama, when he leaves office next January 20, will be the first president in American history to have been a wartime commander-in-chief for an entire eight years in office. It is not an accident that under such conditions, the military has come to play such a decisive role in national-security policy.